Best app ever in the busy business world! APP works so awesome! Highly Recommended. Best way to scan and send. This app is perfect. One thing I would like is the ability to sign documents as well. Maybe that’s in here and I just haven’t seen it, but that would be great to have. I use this all the time for work and other. Such a simple helpful wonderful tool. This app is the best scanner I have ever used and just plain love it!! I use this all the time for work and personal use. It’s a lifesaver, I use it nearly every day! Absolutely the best filing tool I’ve ever used. I use it daily, it’s simple and quick to use, it’s like carrying a scanner with you anywhere you go, well that’s exactly why it is. Thank you ! I’m a teacher and I love this app! I use it almost daily. Simple and gives great quality. I use it all the time. I'll use it over my HP scanner most of the time. Update: I've now used this for several months and like it more now than when I did the original review. Handiest app I've used. 2nd update: after a few years, this is still a “go-to” app! I use this in post offices, after notaries, for receipts, and more. Simple, fast and effective. Got rid of the fax machine and love this. Quick and easy to use! Extremely clear pics! 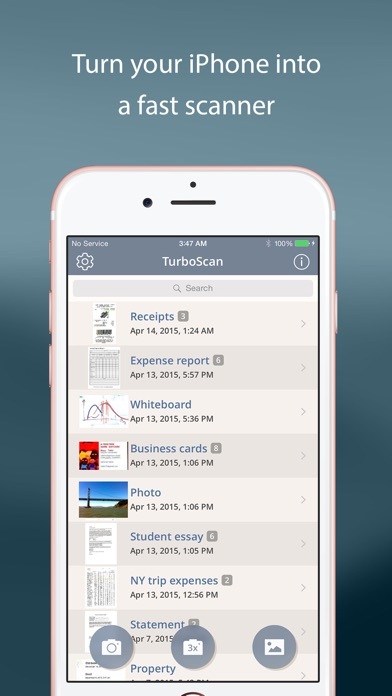 TurboScan has come in handy for so many things over the years whether for an internship, work, school projects, bills, or literally anything you want to save and convert to PDF. I love that you can also send images/docs as text messages. I highly recommend it to anyone. I always have a need to use this app and is a million times easier than trying to find a scanner or a fax machine. Super easy to use! Love it!!!! I have used this App for 6 years. It’s absolutely the best portable scanner. I don’t even use my all in one printer-facet-scanner anymore because this app is excellent! I’ve been using TurboScan for several years. Works well and simply for scanning brief documents. Can’t praise it enough. This app saves time, improves quality and is an invaluable tool. We use it to redline and update 11x17” drawings (ANSI B scale) and our team prefers it over the traditional scanner. This is the best free app out there!!!! I use it all the time in my business. I have used to scan for several years now. It is my go to app for scanning. Highly recommend! Great app. I use the three picture scan save directly to pdf and email to myself for business travels. Works great! This app replaced my regular scanner. It's simple to use. I use this app regularly. Easily the best and easiest mobile scanner to use on an iPhone! This app has been a game changer for my productivity — I literally use it everyday. It’s incredibly easy to use and very reliable. Don’t think twice in making this purchase. We use TurboScan all the time! This is the best App ever invented!!! This app has made it great to be able to keep my documents in line for everything from my budget to work documents. TurboScan is so convenient and easy to use. I love it! Great app and is worth the price! I consider this app to be the best scanner around. From comparing to many similar apps it takes the clearest scans. I would give it 5 star if it had ocr and also be able to name each page. This app is close to perfect. Maybe on the next update. My “go to” app whenever I want to scan a document. I use the single photo mode which I find captures my documents with ease and clarity. Love the simplicity of this app and prefer it over my scanner connected to my home computer. Works great, documents scanned very clear, can send it with many different format options, I greatly recommend it. Been using this app for three years! Love the ease and reliability it provides. It also stores all of my sent documents in one place. Highly recommend! One of the handiest, most used apps on my phone. It works really well. Very handy for receipts and other documents. I love it! Works great. Is simple to use and has all the features you need. Perfect example of a must have app that is easy to use and allows you to get your work done quickly and efficiently. Highly recommended. I use this all the time —highly recommend! I have been telling everyone that this is the most important tool I use in my day to day assignments ! I’m an emergency response Child abuse investigator ! Often time in the process of documentation I’m presented with documents that are valuable to my disposition and valuable as evidence! I would have to sit there and hand write court orders which were incredibly long but now Turbo scan saves me time and that’s why I love it it’s like having a copy machine in my phone and I get to print my documents and clearly submitt them to court! I just love you product! Thank you J Ocampo M.A. Easy, fast, and always works!! I use this app all the time it is so worth the money! Turbo scan has been an unbelievably easy tool to get documents scanned in the field and back to the office quickly! Works extremely well. Makes my life way easier. Was hoping for some options for a dark mode or updated fonts etc. Needs a way to organize scans within the app such as the ability to make folders!! Still 5 Stars!!! Worth every penny of the purchase. I have been using this app over a year. Is quick and very efficient! A few things that I love about TurboScan is that you can have all your documents at the push of a button. There were many times in the military where you was required to turn in certificates and other documents that was lost. It happens more than you think in the military. With turbo scan you can have those documents and send them any time. It’s always worked for me in that sorta sense. I use TurboScan for office and personal record keeping, scanning and emailing receipts, and a variety of other everyday tasks and love it. It’s simple and effective. Works perfectly for on the go. Scan and pdf via email. I love TurboScan. It makes scanning very simple. I no longer have to deal with my temperamental printer/scanner. I can scan many pages for many court file. This app is change my life. It’s wonderful and ever so handy! Easy to use, great quality. Don't know how I ever functioned without it (and never expected to have this much affection for a scanning app.) Update 9/2018 — still great, still love it. Very handy app, easy conversion of photo documents to pdf. Wish this App had airdrop then it would be 5 stars! Very easy to use and simplify important documents getting where they need to go ASAP!! Great App! Helps keep me organized and never any bugs!!! Easy to use and also fun like going to the dentist! I love triple scan. It is very helpful. I have been using TurboScan for over five years now. Works great! I have Thoroughly enjoyed the versatility of TurboScan. I don’t know how I ever lived without it! It’s a virtual filing system for me now! Outstanding. 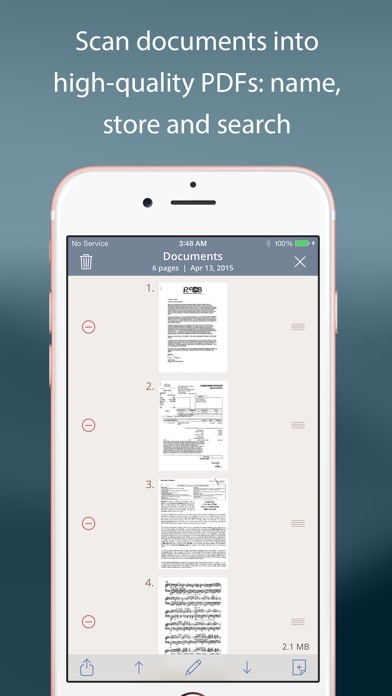 Document scanning app around. I use it 2 and 3 times a day. I have been using Turbo Scan at least a couple of years and thought I’d say a little something. I absolutely love it! The program is utterly simple, easy to use and looks great when sending the finished product. I’m mobile and I can create a simple but clean document for a client in moments. It’s really quite wonderful. It also helps for printing certain documents because it simplifies the file and saves ink and time. I’m a big fan. Does everything it’s supposed to do. Tried similar apps. This one is easy to use and the quality it produces is fantastic. Great on the go and at home. I used this to scan rate confirmations while I was an O/O truck driver. I no longer drive, but this app still comes in handy. I’ve used it to scan trip receipts. Just scan to the trip file and all your receipts for that trip are easily organized and uploaded for expense reports. I'm in college, this app has been very helpful! I have been using TurboScan for several years now. It is so convenient to store important documents, send important documents quick and easy. It has been a big asset for me while managing the affairs of my aging parents. I love this app!!! Very easy to use! If you’re in Business you’ll definitely use this app. Easiest way to scan and send documents. Excellent for keeping track of business receipts. Great app easy to use! Highly recommend it! I’ve had this for over a year now and love it. We use it for our business all the time. This scanner rocks...Have used it for years! Perfect document, etc... scan tool for the field but works so well I find myself using it at the office instead of my high priced scanner. Quick, easy and produces quality scans! If you don't use this - you're missing out. Functionality to save, forward makes this a must have for anyone who has a smart phone & lives amongst humans who still use wood pulp papyrus - I believe ‘paper’ is the current terminology. This is my most used add on app. Should be the next native Apple app! (Listening Apple?) **Suggestion for developers: Sometimes I don’t have time to search files for related docs before photographing docs. I’d appreciate incorporating a merge function when multiple scans can be bundled into one. Love this app and use it regularly for home and professional business. I have been using the app since 2009. It became part of my everyday life. Use it all the time! Love the convenience of being able to email docs right from the ap. Works great every time! I own a scanner and have used it for years but now I find that Turboscan has replaced it. It’s quicker and easier to scan and email with TurboScan than with a hardware scanner and I have a record of it without having to use a paper file. I use this for my own need to scan as well as for clients. So easy and safe! I'm such a perfectionist, and I LOVE this app. I use it for documents for business, and for photos for personal. Clear and sharp every time. One of my best apps!! Use it often, and always works great. I love TurboScan it has been my life saver. I love this app! I can’t think of a thing to complain about, or ask for. Wow. The perfect app for all my scanning needs. I can edit the title, combine pages, send multiple times, retain a copy if I want (purge periodically if you’re short on storage space in your device). I’ve been using turboscan for years. It has never crashed. Easy to use. I do ALL my PDFs using this app. Easy, can add & rearrange pages on a PDF. It’s the best. Been using for a few years and have had ZERO complains. It’s a solid app that is quick to learn and easy to use. I’ve relied on it for years and it has not disappointed. Can crop irregular size docs nicely and send or copy easily. Only caution is that the app automatically retains your work in the app, and can leave you vulnerable if your phone is ever compromised. A little care goes a long way! On the go. Mobile office 24/7. What more could you ask for? It handles all my business and personal needs to deliver documents. I have used this app for 5 years and it has been a FABULOUS tool for me!!! It hasn’t failed me yet!!! This scanner has been very easy to use and produces a clean scan. I use it everyday. It is my favorite and most used app. How can it be as good as a scanner? Well, it is. It's faster, takes out creases in paper, just great. Very happy with this app. The best app that I have! This app works flawlessly! *Update 08-03-2018 * Still loving it! This app helps fill the gap converting my paper-to-pdf/gif then email them out for my various purposes; including expense reports or documentation reasons. * Update 05-28-2016 * This app is still awesome! I have been using this app (what seems like) for a few years now and I use it almost constantly for business and personal use. It pays dividends in terms of being "paper-lite" and not struggling to find the receipts for your expense reports! Fantastic app. Find a use for it almost every day. Flawless!! Just was telling doubtful husband how awesome this app is. I use it weekly - great app! Love it. Absolutely no complaints. Great app! Using it often! Simple and Fast - Works Great! Really works great for my on-the-go real estate office... I have recommended it to my contractors, other agents, etc. Anything that saves me time and provides me with a digital record, saves me money. This is both a keeper and a money saver. Well worth the money spent! This has been the best scanning app I’ve ever used. Consistently accurate and clean. Love it!! Clear and easy to manage the app. No more messing with pics of documents! Love, love, love this app! Been using it for years. Does everything I could want and more! Turbo Scan is awesome. I continually encourage colleagues to get it. Love this app. I use it for everything that I need to scan and email elsewhere. One of the 3 x option. I’ve been using Turbo Scan for years and it is my go to for safe keeping all my documents. 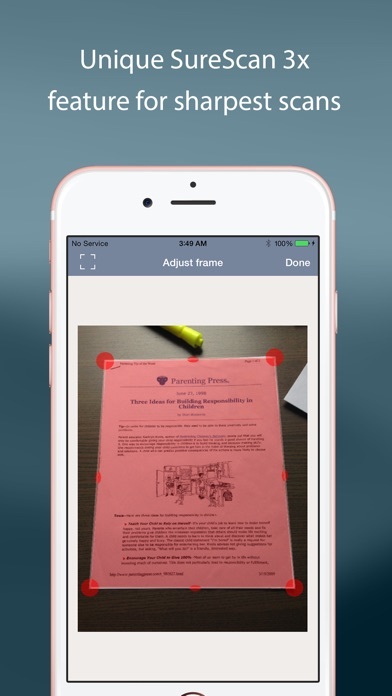 So easy to scan multiple pages and share quickly. Also handy to have it fingerprint enabled for security. One of my favorite apps!!!! Best money spent! I use it at twice a week! Easy to use! Makes my life a lot easier. I use this app almost everyday . It has saved me time and is so convenient! This app has literally changed my life! I used to dread scanning proposals and invoices, now with this app, it’s taken all the work out and made it so easy !! Ty so much for creating this app! This is the scanning equivalent to Waze on the road. It keeps my affairs going when I’m unable to get to the office. It works easily and well and the scans are of remarkable quality. If there were more stars to award this app, Turboscan would deserve them. I use this app primarily when I want to practice a piece of music from the archives of my church. When the music book is old, worn, and especially out of print, I prefer to make a copy which I can mark up and spread out rather than having to turn pages. This app allows me to copy the music without damaging the book and saves me time from having to adjust the music in a photocopy machine. Also, I love the fact that I can then save the copy in a pdf file and can email it to myself as well as to our church soloist. I also use this app to copy a random note and save it in a folder. I’ve been using TurboScan for years. I’ve tried many of the apps that convert to PDF, Including Adobe’s version. This app is way better. Totally worth the price. Awesome app, easily uploads and edits without to many steps. I'm a finance manager at a large Lincoln/Volvo dealership and I use this app quite regularly to forward documents to banks and customers. It is worth it's weight in gold. So helpful. So useful. So convenient. Makes great PDFs. I don’t know how I accomplished anything prior to owning this app. Have had it for several years now and it’s still one of my favorites! So fast & easy to use! One less device to carry around when it can be on my phone. Love that I can email as a pdf & save within the app. Phenomenal app. Use it constantly. Makes life so much easier!! One of those low cost things that just make life easier. For all small business owners and parents on the fly. Anyone with no time or money for a scanner. It's right here. Make a multipack document in seconds and send. The app is good if you just have one device. However, syncing to two devices is terribly implemented. This app makes doing business in real estate, mortgage lending, or even personal business simple. Could not do business on the go without it! Ripped me off by over $30. DO NOT BUY THIS APP... says it’s one price and then they charge your card literally 5x as much.. absolute CON!!! BUYER BEWARE!!! I’ve been using this app for years, and had used many. Everything works very well and very intuitively. The built-in share functionality is superb. I really, really wish that the frame routine accounted for bound targets though. When trying to capture bound material, having an additional vector point along the long axis would make this program literally bulletproof perfect. Love having access to important documents that I frequently access. This app has changed my life!!! Love it!!! Love it. Teacher- whenever I need to digitize or email/save documents this is terrific. Use it all the time. Formats better than pictures. Best scanner that fits in the palm of your hand! TurboScan is a most amazing product. It is so easy to use, the scanner works easily and labeling your documents and sending them are all quick and easy applications. I’m known to be computer tech deficient but this is so easy even I can use it without any problems!!!! I love this app! I use it every day! I scan documents I sign straight to pdf and can email or send them in a text message. Who needs a scanner anymore unless your needing a 20+ page doc to send. You can easily add multiple pages. They scan to pdf so they are easy to print. I highly recommend this app! I use this app for work and personal reasons. My wife and I have been filling out and signing mortgage documents between two different states. TurboScan has allowed us to be in two places at once. The best app period. I use it every day to communicate with colleagues and crew members. This app changed the way I do my business daily!!! I never have to worry again about having documents sent from anywhere. Please thank the architects of this app for me. I use this app more than any other app on my phone! It’s easy to use, and scanned documents come out better than using a copy machine, or scanner. Turboscan is awesome. I use it nearly every day. I use this all the time for business and it’s flawless! Love it. Best app for paperless accounting of receipts! I highly recommend this app for anyone who does not like keeping the endless paper receipts. Especially great for college kids who have never kept track of things like receipts. Thanks for this tool, simple, fast effective and free! The convenience of taking a picture of anything and filing it, turning into a PDF, etc., it’s well worth it. Use this app all the time! I have been using this app for years now. It is fast, accurate and simple. I make PFS’s on the fly of everything from huge drawings to little receipts with just a couple clicks. The app makes great photos plus it takes my off angle shot and makes it square. I’ve made beautiful PFS’s of my Uncle’s many oil paintings, and the quality of the pictures is just great: square, no glare, good color reproduction and well Theres just nothing better. What a great scanner !! This is surely one of my most beloved apps. I am a professor and write out lecture notes for my classes at Carnegie Mellon University, then copy them with this app and distribute the copies to my class. This app is great. I've been using it for the above purpose for many years. The only (slight) improvement I would request would be an option to have the initial framing be a tiny bit larger, so it would include my notes at the very margins. Sometimes those get cut off and I have to manually enlarge the frame. No biggie, but it would be nice to have the option to request larger framing from the get go. In any case, this is an absolutely awesome app. I absolutely love Turbo scan! I’ve used it so many times over seas I don’t have a printer available or scanner. Love it! I would be lost without this app!!! Fantastic app. Please keep up the good work!!! I can’t imagine there being a better app for scanning. This does absolutely everything needed. I use this app mostly at work. I make PDFs of parent notes, tests, letters I receive from parents, notes from lessons for students who are absent--basically, anything and everything I want to keep a record of. I also use at home to make PDFs of anything that requires me to sign and return--forms, letters, applications, etc. I also scan any worksheets that I come across in my children's homework, which I think are useful for my students and email them as PDFs to my myself and colleagues to print and use. The quality of the documents I scan is excellent and it's so easy to email them as PDFs. I am impressed and I always recommend it to anyone needing a scanner. 5 stars and then some!!! So easy to scan any document of any length. No need to find a physical scanning machine. You can add pages, adjust darkness, crop images, all on your phone. Convenient. Save, email, print. So useful! I’ve been using this app for about 3 years. It saves time and space and it’s so convenient. Don’t need a regular scanner if you have it! It’s a must have for any person on the go, or if you’re just needing a good way to keep track of receipts. I been using it for year in my business and is great. I have recently had a larger number of documents to scan and email. TurboScan is easy to use and functions perfectly. Would definitely recommend to anyone need to scan and email documents. TurboScan is my essential Go-To app. I scan docs, receipts, pics, passports, meeting notes, shopping lists, then I email them to myself for easy search the titles have the year and subject. Or email them to someone else for their reference. Also when somebody sends me a document to sign I simply print the pdf file, sign the document file and scan the signed document back into a pdf to be emailed back to the sender. Scanner in my pocket. I can then dispose of the paper document because I can always find what I am looking for through Search. All this on my phone with a few seconds of app time. Love it. Resolutions are great. The new 3x capability is nice to have but 1x is so good I don’t find 3x necessary. I could not imagine not having this app. Easy to use,& convenient. I have not scanned a document from my printer since I’ve installed it. Such a timesaver! Works great and easy to use. Would recommend to anyone. Honestly I can't say enough good things about this app. Recommended to a lot of people especially those who travel. Still the best app i use. Have been using this app for 6+ years now!!!!!!!! I transfer all my onsite work related documents with this app to file electronically as well as attaching them to emails and reports at the end of the day. With a mobil office this app is essential for me. I can take pictures of any document that might be important and easily create a pdf of it later if necessary. Worth every penny!! TurboScan makes my life easy and organized. It’s an App I will always have. Absolutely terrific. I’ve been using it for 3 years. It would have 5 stars if they would develop a way to organize / file each scan. Operates at nano-speed; accurate scans; near-perfect auto margins; great sharing options. One option missing - folders in app itself. One of my favorite apps. Oh, it’s free! Easy to use app! Lifesaver! I absolutely love Turboscan! It is worth every penny!!! Such an easy app to use!!! I love this app to keep all of my business receipts organized. I take pictures, file by name and amount and it makes my life EASY. No more envelopes full of receipts! I also keep my important wills and legal documents secure here. This app makes my life much easier! It is by far my most used App on my phone! I use this regularly this the best app. On my phone. Great app. Highly recommend it. I’ve used this app for years! I LOVE it, and I’ve recommended it to friends and family members. I’ve used this over a year professionally. It is simple to use and provides many formats to store and share. I recommend to all my colleagues and friends. I’ve used it and it has performed so well under many different circumstances that I have never looked for a replacement. Everyone should have this app. It works perfectly and is worth every penny. Lifesaver for my mobile business! Works great every time. Professional quality PDF’s. Works very well, keeps track of all your documents, allows multiple pages to be saved as a PDF. This is a valuable asset to anyone doing business. I have been using the scanner for the last three years and it truly is amazing. I love the way that you can save as color, text, black-and-white and send it in various formats. It’s worth it’s weight in gold. One of my most used and favorite apps. It’s one of the best apps I’ve EVER installed on my phone! Five stars!! Use as a scanner on my phone (mobility) can, message, mail, print, evernote, PDF, send to my mac for whatever I need, keeps a copy for archive, print then fax, compress, zip...this app does whatever I need it to one of my go to apps. I really like this app but it needs auto page detection so that you don’t have to click the shutter button every time. I’m hoping they add this. I tell everyone about. Very versatile for creative types. A must have. Never been a problem. All good. Does it all! I dont use this often but when i do it is a huge, huge time saver. No bugs that i have come across. Highly recommend. My boss, who works at a remote location, can't get emails. I use the scanner to text documents to her with my iPhone. Works great! Have also used it to scan architectural drawings. Very versatile. Would rate it 5 stars if there was a way to remove shadows and if it would scan newspaper clippings more clearly. Turbo Scan is the best! Couldn’t be timely without it! Easily the best app I’ve ever purchased. Works flawlessly and does exactly what you’d hope it does. Install it. Just install it. Once you put it in your bag of tricks you’ll be using it every day, and wonder what you did without it. I can’t image doing my job without this app! I personally recommend the app to all my friends, family and clients! This app is awesome. We have a high end scanner in the office, yet most people use this app instead. Between project paperwork and personal ancestry research, TurboScan is an essential tool I could not do without. Super app! easy to use! Super easy to use, I wish every app was this intuitive. Exactly what I need to make PDFs of paper files. All I need is to take a photo, name the document,And it’s ready to use or save to storage. Awesome scanner when I’m on the move. Easy to use and is very useful. Long gone are the days where we had to have a dedicated scanner with crappy software to hook up to a computer in order to scan household documents when requested from outside agencies or for archival which was followed inconsistently anyway because it was too much trouble to set up. So easy to use TurboScan in the fly with great results even for 11” X 17” documents, Can email as PDFs immediately, totally flexible for rapid response items to get things done with no nagging back of your mind “when I get around to it” procrastination. Retain cars proof of insurance docs, download from insurer and email to others on your policy. Too many uses to mention. I have used it for years. Best app I have. 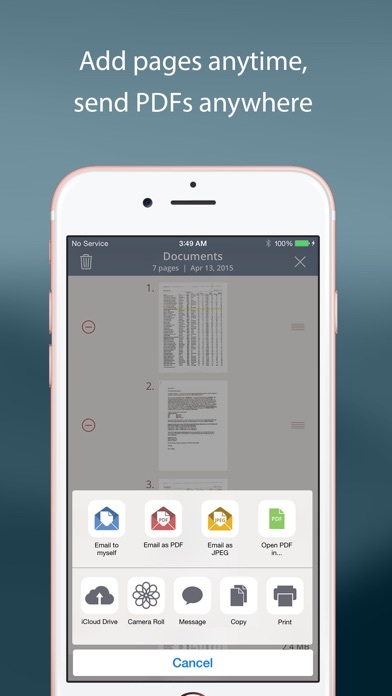 I work in the field and I use this app everyday to scan docs and send PDF. The option to open PDF and AirDrop is also really convenient. Great Job Thanks!! This is a great app for scanning to .pdf, and emailing travel receipts, or whatever to a spastic folder. No more holding onto receipts! This app saves me so much time and effort at work and at home for scanning and editing documents! I could not function effectively without this app. I have been using Turboscan for years in school, work, and personal life. The ability to take a picture of a document from any a angle and have it projected to appear flat has been a huge time-saver. Turboscan is a must-have app. I LOVE this app! It is so user friendly and can be used for official documents like transcripts. This app is integral to my job. Can’t imagine not having access to this valuable tool. As a remodeling contractor, this tool is invaluable to me for its ability to convert job-site paperwork and dilemmas into pdf files to send out instantly as an e-mail or message to my tradesmen. Scanning can’t be any easier. Best app on my phone. I use it for work, I have scanned all documents for closing on 3 houses. Easy to navigate and search for documents by title. Don’t know id do with out it. I’ve been using turbo scan for several years now. It is easy, convenient on my phone, and excellent quality. I can quickly snap photos of receipts and other documents and store them as PDFs and email them to myself and others. I am a professional violinist, and frequently use turbo scan to transfer music to my iPad, where I do most of my reading. Perfect quality and easy to read, even very complex pieces of music. Fantastic app. As a Realtor I am constantly out in the field needing to scan something. I use this all the time. It saves me soooo much time. I've used this for several years now. I've not had any problems with updates causing issues. Simple to navigate. I made my wife and kids all get it too!!! I use it for all my trips where I need to keep track of my receipts. Awesome makes my work easy. Love this app. I am using this program for several years and it function excellently. I will not change it for any thing else. I have been using this app now for while and had been totally satisfied. It is a useful that I used it so often. It is an important tool where I keep all types of documents. ...used this app for several years (I scan almost everyday). It’s awesome! Produces very clear scans. Crashes occasionally while using SureScan. Been using for the last 3 yrs My life made so easier!! Highly recommend it . I use many Apps but TurboScan is the one consistent that I use. Scanning business cards and filing them is so very easy. Plus all of the other information I scan to save and file. It is the best! This app is excellent for scanning documents. User friendly and simple to master. Highly recommend. My favorite and most used app! Really my favorite app for productivity. I’m in seminars and classrooms all the time, taking notes. So I turn my notes into PDFs almost as soon as one page of handwritten notes is done, and that way it’s all “Scanned” and uploaded to dropbox before class is over. And I have them to view at a moment’s notice whenever I want. I also scan my receipts that are critical. Scan my warranty cards when I buy new stuff. Scan special instructions on products that need special handling. And since it goes to dropbox, I have all of that at the touch of my fingers whenever I want. Love this app! TurboScan is one of the most convenient apps. It is very useful for sending documents quickly and efficiently. Important information can be sent anywhere at a moment’s notice. I thank the ingenuity of the people who made this app.😀. I rate it a 5+! This app is easy to use and very practical. I can make copies of documents to send to others easily and easily turn documents into PDFs. I have found this app valuable for what I like to do. This little app has saved me countless times when an electronic copy of any file is needed immediately. The scans always come out legible and the app links to email flawlessly. I’m still amazed that a pdf scanner isn’t a default utility on the iPhone similar to a calculator however I am extremely happy with the ease of use as well as functionality of this scanner. Well done! I work in the legal field and am on the road all the time. This app is awesome and worth thousands of dollars to me. Can’t overstate how much this app means to me! Best effective clear and simple scan/send tool! I use it in varieties of ways. It adjusts and frames images that I title with date for quick reference. It’s an invaluable record keeper for me. I am not a techie and I love this app. I use this to scan documents professionally as well as personally. 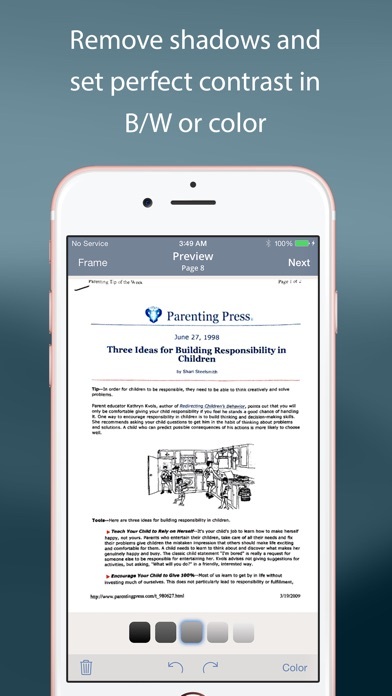 They are clear, it is easy to scan multiple pages into one document, changing the frame of your finished scan is very easy, there are multiple options for saving your scan as a PDF or other file types, it's easy to send in an email or a text. Easy to Use Love It! I use this App all the time. I am Salesperson by trade and this App is great for Submitting Expenses or Scanning technical prints and Etc. I would highly recommend this App. The app has started locking up or freezing when I open the camera to scan. I have an iPhone X. No other app is causing this problem. This app does a very good job of scanning. If the light is even and at least moderate, the app can produce a quite good scan. This is perfect for scanning all my business receipts quickly and mailing them to myself to save on my hard drive! I recommend the app for everybody. I even got my husband to use it. I have recommended this app to people I work with , organizations I belong to, all see the value of a portable professional scanner. I buy this app for all my employees. Makes keeping track of documents and notes out in the field a breeze. A very simple, straightforward, quick and easy app! My favorite app - Turbo-Scan! Great features! Affordable!! Convenient!! Reliable!! My SIXTH year and still my favorite! I wanted to use this app to quickly capture whole pages of a High School Album. My iPhone camera offer more clear pictures. I tried all setting including the ultimate 3 picture for maximizing clarity. I had high hopes but was disappointed. I use this app everyday for scanning everything from business documents to magazine articles, recipes, and my personal files. It is fast and the quality is exceptional. Love this app, I use it all the time! For home, work, etc., making documents is so easy. Use it all day everyday. No need for expensive scanner! Best scanner I've ever used. Awesome portability. Would highly recommend to all. Would like to see in future for iMessage or texting articles and or pictures. Been using for years and very effective. I use quite frequently to email favorite recipes or scan documents for digital copies. Latest update causes the app to crash and closes which deletes the last page scanned. Multiple scans is performed and always crashes on the 13th scan. Need to redo their update back to the previous version which worked perfectly. Turbo scan is easy to use and has saved me in submitting school assignments, credentialing requirements and submitting resumes. I have recommended this app to numerous people. Turbo Scan— Gets 10 Stars! User for 4+ years and this is a superior Free app! I have used this app on both iOS and Android platforms and the interface is the same; you can adjust frame size of the item scanned, add multiple pages, adjust light intensity, use date stamp or not, and I love how you can copy scanned item to photo album or email it as a jpeg or PDF ! **Excellent image quality in both jpeg and PDF formats. The best scanner I have ever used hands down. Highly recommend !! Perfect for business on the go! I got this app to help me keep track of safety documents on the job site for reporting purposes. It is very easy to use. The options for Joel or color or black and white is very useful. I recommend it for people who need to convert hard copy documents into digital records in an outside, jobsite environment. TurboScan has been incredibly useful at a cost small enough I felt good about trying it out. Great for work receipts, and some other documents too. Tried several scan apps but TurboScan easier to use and best quality. Use it all the time. Have given up desktop scanner completely. Want to create, store, locate & send PDF’s quickly? This app is flawless! I have used this app for the past 5 years. I access it & use it everyday!! I really enjoy using this app. Great product. My most used business app! An excellent application! The earlier version I purchased was good, but the upgrade was fantastic; I can recommend it (& have!) w/o reservation. Great app. Use it all the time. Great use when getting a mortgage. Keeps my wallet empty of receipts! Document very portable. I love using turbo scan for all of my real estate needs. I’ve been using this app for months now and I’m very happy with the updates that have come but the most recent ones have been getting on my nerve. I like to play music while I’m at work and I scan often with my job. I’ll be in the middle of a big document and the app will completely close out and as I click back in it will say that I need to restart my entire phone. When I do that it does nothing. The app will still continue closing out. I hope that this will be fixed. I’m not going to stop my music for this. (It’s the only thing I could think) the app worked before with the music playing. It’s a great app, just needs to be fixed up a little more. I use this all the time. What a life saver! This app does its job, scans very well. TurboScan is exactly what I was looking for in a scanning app. It’s very easy to scan, send out, and store pdf documents quickly, with no hassle. It’s easily the most useful and best app I regularly use. One of the few apps I’ve actually paid for but well worth it. This is so simple yet great to have it’s the best thing made for a phone. I love it. Works smoothly and produces great results. I often prefer it over an actual scanner. Only complaint is that b/w and color modes miss subtleties in shading, while photo mode does not "white out" the blank paper. Feature request: support more /custom page sizes. I sometimes use it to scan blue prints, but lose scale. The best app, it is easy, fast and reliable. Been using this app for about 5 years now and I love it. I even found old document that I physically lost but found here on the app. This app is a life saver. Beats having to use a printer and scanner. This App is intuitive and works well every time. Highly recommend and personally I am not one to give a 5 star rating so easily. I use it all the time and it never fails. I’m a contractor and am on the go from site to site. Turbo scam works great to photo specs and notes from manuals that I can forward to sub contractors. This app is the one I use the most by far. Keeps things organized! Great tool for me! Best scan app ever!! I've been using ScannerPro and TurboScan. I found the quality of TurboScan is much better on the TurboScan. Very intuitive. Makes .jpg files that are easy to handle. Turbo scan is affordable, convenient and easy to use. I am very pleased with this APP. It does a great job and is easy to use! I Use this app every day it's totally invaluable! I absolutely love this app couldn’t run my business without it! TurboScan has saved me numerous times!!! TurboScan is a great tool to capture and organize anything ! I keep all types of information in my scan files. Pictures of our favorite wines, liquors, plants we have, plants we want to buy, items we are researching, gifts, etc. I can access it and have all my information at my fingertips in the files I've created. Best tool ever! Must have I use it daily! TurboScan has made my “financial life” much easier to manage... as a retiree it is very important for me to keep track of all my expenses... this app makes that very simple to do. It is very functional and gives me all the features I want or need. This app allows me to bypass my fax and save significant amounts of time, no longer having to scan items on my printer and upload them to my computer. BY FAR one of the best apps I’ve ever downloaded. TurboScan has the best interface and is the best at finding the edges of a document but it still has an issue with dark areas. I reported this a couple years ago and it’s still not resolved. When the app scans a document with a larger dark area such as a logo, large bar graph or pie chart, it fades out the area which looks terrible and is often this unusable. I have to use a different app to scan these types of documents and we shouldn’t have to. If this ever gets fixed, TurboScan will be by far the best scan app but this issue holds it back. Use this app for everything! I don’t usually pay for apps but this has been the MOST useful. I just “scanned” and sent paperwork to my attorney. So easy to use, convert docs to PDFs, email, text and more. Can do single pages or multiple in one document. I never use my scanner anymore! Who needs a scanner with this app? So convenient and user friendly! The app is easy use, very straight forward. This is so useful when it comes to keeping track of important documents and has even helped me when I have to save written notes (school/Work). I recommend this app 100%! Best app I’ve had tge privelage of using - EVER! I use this scanner app to scan hand written reports in the field for work. I can then search for any past report in the field. I bought it about 2 or 3 years ago. I forget how much I paid for it but it is worth ten times as much. I have been telling everyone about it. It is logical and well thought out. Push one button and the scan will automatically be emailed to you. You can also start files with a collection of scans. I use a file to keep track of my monthly expenses or traveling expenses...no more paper receipts folded in my wallet! You will not be disappointed. It has some high def features that I don't use. Easiest app to navigate and process documents through! How did I manage before TurboScan? I own a business. Every document I frequently reference or share is now scanned and shared with TS. They’re all at my fingertips. I keep all my personal records such as birth certificates, driver’s licenses, credit cards, even images of my vehicle license plates on TS. Again, TS makes it quick and easy to grab these docs and get them to whomever needs them. So much better than just snapping photos. Being able to give an image a title makes it super easy to locate it when I need it. Turbo scan - Turbo for sure!!! The best thing for my work!!! So convenient, easy and helpful! I recommend it BIG time!!! It is so easy and handy to have on my phone. I have used it for photos and needed documents. Love it! Great product. Especially when traveling. It is nice and convenient to use. It is helpful and very useful to look at when you need something at a later date. Great app, just one issue!! Great app, the only issue is that after about 20-30 photos the app will just exit to your home screen. It gets quite annoying! Several other people I know have the same issue with this app. I have sent 2 files that I scanned on here and I still haven’t received them! I have had this for over six years. It has gotten better and better over the years. Are use it for everything. Great App. Best app in the whole wide world! I could not live without this app. I put everything on it and name each file with as many words as I need so I can pull them up easily. (For example: Photos of my grandkids, business files, taxes, receipts, things to remember, shopping list, and on and on). I must have over 2000 files in this app. I use it every single day and love, love, love it!!! Thank you TurboScan. I love you. Love the Turbo App! It does exactly as described. Save time and money being able to copy in varies modes and immediately forward. A MUST have for a busy person on the go, or to eliminate clutter, by having copies of important papers at your finger tips. Esta es una herramienta muy útil en mi trabajo, puedo compartir y archivar documentos en forma rápida en donde sea que me encuentre. We are a small family headstone company. We use TurboScan every day to forward our approved drawings to the manufacture. This is a great tool!! Love using turbo scan from my phone. So handy and fast!!! I have recommended this app to as many people I can. I work in Production and find myself in places that don’t always have a fax machine near by. This has saved many times when I need to submit contracts to my vendors. Lo uso mucho, me es muy util y solo quisiera que de manera automatica se registrara en una"nube" por si accidentalmente se borrara. O se perdiera No se como podía atender tantos asuntos cuando no tenia esta aplicación. Excelente! Super easy to use, super reliable! So easy, even I can do it. Never failed. Recommended it to all my colleagues who now use it. Every program should be this terrific! Perfect for keeping everything in one place and at my finger tips. Best easiest app I ever bought. Use all the time on phone and iPad. It’s the best. So easy and convenient. Saves me a ton of time. Works perfect and is easy to use. This saves so much time. I got this app a few months ago. I needed to scan my receipts and submit them for a federal grant. The quality is amazing. So clear and readable. Even scanning photographs is great. Again, very clear. I love this app! I like that I have many options to save. Including email to myself. Excellent! Update: I continue to use this app for years now. It’s the best one out there I think. This app is SO useful. I use it daily and it scans perfectly every time. Perfect for the businessman on the go. TurboScan is easy and user friendly! I use it all the time. I absolutely love it and recommend it! Converts any document to a PDF that you can email. So helpful both personally and professionally. Love this app, I use it daily for my business. Quality grabs of the documents I need, nice framing option to clean up edges, and easily saves and sends. Came in handy many times and very easy to use. Best app I’ve ever used. Remarkably useful and effective from the office to on-the-go. Using app a lot and long time . Nice job . 5 starts , strong 5 starts . I find this app very helpful while traveling to scan receipts and save. This is my most favorite and most used and most valued app. for 8 years now! Best app I have ever used. This app has saved my bacon! Although not as convenient as a desktop scanner with feeder, this app has allowed me to email a lot of documents on the fly. It's easy to use and produces really good images with the IPhone 6 Plus and iPhone X . An everyday tool in my work.. much easier to work with than another app With similar capabilities that I have to use to transmit documentation for which I simply upload work done with TurboScan to submit! Great way to keep important records accessible! I have car registration, birth certificates, passports, etc. And credit card info. I’ve downloaded this app to help out my husband with his work. And also have been using it myself to send documents back and forth to family, friends, co-workers, etc; and it’s been great! Love how it frames the actually document and then you clearly see the words within the document. Super easy to use as well. This app does an awesome job scanning sheets! It’s fast and simple. Love this!! Have shared with everyone I know. Worth well more than 2 bucks. It helps me keep track of meeting expenses as well as instant on the spot PDF conversion. Can't believe it took me so long to find out this exists!! Also, I love the functionality-- you can arrange and re-arrange the order, add to or delete from, and even send just one item if ure not ready to send the whole scanned file...I could go on and on...oh!! The only improvement I see this far is better color imaging. Not great for that so far. I was skeptical about how this would work but with 111k reviews it had to be good right? I was pleasantly surprised. This is probably the quickest and easiest scan program I’ve used and it Just works. It’s intuitive to use and it turned probably 2 hours of work into 10 mins. I would have had to hand scan each receipt and upload it to my pc then email. With this program I can do it all in one shot. This helped getting receipts to an insurance adjuster really quick. Love the simplicity of this app, I had been using it for a number of weeks in a row and it just works, however I wish it had a few missing features, for me personally the ability to create folders in the app to make it so adding documents together for ease of locating or grouping importance would be a very good addition. Over all though it works as described and does a good job. Awesome app - worth every penny! I love this app. I travel often - so scanning passports and documents has always been a painful task, this app takes the pain out of scanning. Best app ever! Worth the money!! I love this app! I used for work and personal business. I think I have recommended it to everyone I know! Use this DAILY!! Scanning receipts to our accountant, documents on the go. The ability to save to Dropbox is KEY!! TurboScan - the greatest office app handy!!! Get it you won’t regret it. This is the only app I've used that works flawlessly every single time over the years! Perfect and flawless! If I could only keep 10 apps on my phone this would be one of them. I use it constantly. It has helped me to eliminate the stacks of articles and documents I tend to accumulate. I have set up a file structure in Dropbox so I scan documents with Turboscan then I immediately upload to them to the appropriate file. Into recycling the paper copy goes!! Thx for helping me to declutter! TurboScan is a fantastic app! It creates beautiful scans of any paper documents or pictures that you have! You can also easily send these scanned images by email, text, etc. Searching for scanned items is easy too. Start getting rid of the clutter using TurboScan. You’ll be glad you did! I am! This has been my right hand app since I have needed to fax many documents over the past seven years. It is handy to take a copy of any document on the spot right in a meeting. I LOVE this app!! I also have a copy of a number of critical documents on hand when I travel - like passport, green card, etc. Use it ALL THE TIME! This is actually the only paid app I use... its that good! I love this app, I use it almost every day! You can scan email and verify convenient application! I would recommend it to anyone that wants to do things on the go! I love this app. I use it at work for everything. This is the easiest way to get a document, photo or whatever you need sent to someone by email in the format of either PDF out jpg. There are other cool options but these are what I use the most. I can be anywhere I have service and go hard copy to digital in a matter of minutes. I’ve had this app for 3-4 years. It’s great at scanning documents to save electronically. It lets you edit the frame of the scanned document. You can also save in color or photo. I use this weekly for saving documents. This app would be much better if it had autocorrect and learned words. I primarily use this app for entering receipts. Many are from the same places, but as I type the app doesn’t realize I’ve entered the same business in the title 300 times. This means I have to spell it out each time. Not a huge inconvenience, but it would be so much more efficient if it memorized certain words. User friendly & easy to name the document & email. Highly recommend it. One of the best and easiest app I use on my phone. Can’t do without it. I use it to make a PDF copy of my work invoices and it makes a high resolution copy that is easy to email. Extremely useful app. My only disappointment is that the scanned files can get VERY large. One time I scanned only 2 pages and it was nearly 2mb large! Compare this to the original unscanned document that was 20 pages but was only 1.5mb large. Very useful tool for business !!! BEST EVER.....I LOVE LOVE THIS AP! ITS TRULY AMAZING SAVES TIME AND ORGANIZES ME! Love the app. Have used it for over two years and no complaints. Lots of options and easy retake when I mess up. Love the rolling backups. Very convenient and readable copies. Excellent for real estate agent use. Turbo is the best thing ever I have had it since 2012 cannot live without it :-) helps for work travel and for the cost! love it! it has saved my work and so far secure and safe! thks turbo! Scanning docs is a breeze. This has made my life easier! So easy to use. Never had a glitch. One of my most used apps! It works great! Works better than a traditional flat top scanner. I use this app nearly every day. I use this app all the time! It is the most useful app on my phone! Thank you for creating such a worthwhile application! I helped a man stuck in an airport who was hand carrying a presentation for a meeting he was going to miss due to a delayed flight. He was desperately seeking to send the presentation by facsimile but to no avail. I offered to scan and email it using my Turbo Scan app! He was so happy! Your app saved the day! Thank you again! Cero Error, Siempre Efectivo, No Tiene Falla! I’ve been using this app for years now! It is the easiest way to scan and store documents. Hands down!!! Very easy to use product.. I can easily forward PDF documents to my business partner and works well.. This is the best app on my IPhone. Perfect, fast scans that are converted to pdf’s instantly. Seamless emailing. I use this app more than any other for work and personal. I use TurboScan every day to help me manage both my professional and personal life. A few years ago I did a comparison of all the popular scanning apps just to make sure I wasn’t missing anything, and I decided on this. It did not disappoint. I utilize this for my business in Realestate all the time. It's great. This does everything I need while traveling, allowing me to scan and fax from anywhere. I use it when I’m working from a car or plane or cafe! I haven’t gone to fedex or copy store in years. Ive been using Turbo Scan for a few years now and it has saved me time and money by not having to locate a scanners at work. It’s a very useful and easy to use Scanner. Awesome!! Love it!! Try it, you will like it!! Nothing pleases me more than this...use it every day!!! I don’t work in an office, so I don’t have access to a fax or scanner so I depend on Turboscan. I have used it many times, often in tight timeframes and it is great. Easy to use too. I’ve been using this app for over 5 years. As a college student it helped me make up missed notes, copy ppt slides, and saved me the cost of a few of those ‘buy my $300 book for this class and we’ll use it twice before you resell it for $10’ deals. In the workplace, this app was even more valuable. Especially when I was working in the field, I could quickly create a clean-looking pdf scan, email it to billing, and by doing so back it up in the cloud. A minute while parked at the job site on this app and I’d leave a job site with my part of the deal done and backed up. NO MORE LOST INVOICES!! Definitely a five star app. It is among my most valued apps, if under-appreciated. It’s one of the only apps I have that I’m a bit sad that it took me (probably over) five years to write this rave review. Great app for a person who needs to scan out in the field. Use it all the time. As the cameras get better on the phones the app gets better too. Easy to use, great little app. I use this all the time me for travel receipts, and quick scans of documents like homework and permission slips when I’m not around a scanner. It is easy to email the PDFs. Best scanning app out there, used this one for years. It’s perfect! The most outstanding scanning app ever! TurboScan has made it very convenient for me to get work done at home, so I don’t need to make an extra trip to the office! Love it!! As a contractor I could not do my job without it. Taking scans of surveys in even very low light works well. I put it to the test everyday. This is a real review. One of handiest inventions ever! TurboScan is a great way to organize your personal medical records. Scan those puppies in and you have the real thing. Now you can do it with multiple sheets. Good work! This app is fantastic I’ve been using this app for A couple years now. And it works as advertised!! I use this app all the time, it’s easy to use and incredibly useful in day to day life. I use this app to do everything expense report related. A must have. I do a lot of scanning on the go. This app works perfectly. I can scan and send in minutes. Easy to use, clear scanned images. Have used for years with great success! I’ve been using TurboScan for several years now and absolutely love it! It is SO convenient to be able to scan items by taking a picture of them on my phone, instead of having to be at home, with an actual scanner, get on my computer, etc. I can scan a document anytime, anywhere with just a few clicks and immediately email or text them to whoever I need to. I’ve never had any problems with it and no complaints ever about an image not being clear enough, etc. Looks like it was scanned on an actual scanner every time. SO easy to use. Again, love this app and highly recommend it! I wasn’t sure if I needed this up when I first downloaded it. It has become incredibly handy especially if you are a business owner. Pretty much Eliminates the need for a scanner at your desk. Can’t email to gmail scanned docs. Says sent. Doesn’t work. Too bad. That’s all this app was good for. Now it is useless. Will delete after 3 years on my phone. One of the best app purchases I made! Nice set-up taking three pictures improves resolution. Also the B/W, Photo, Color modes are good at dealing with shadows. Overall this is a great app. I love this app! I’ve been using it for my small business for about 3 years, and it keeps getting better. Scanning good-quality documents and creating PDFs are my most common uses. I also value the security, and appreciate the addition of the Touch ID feature for handling confidential client information. It is a great tool to use to declutter paperwork. Easy to share information with family members. One of those apps that’s kinda like windshield wipers: when you don’t need em you barely think about em, but when you DO you sure are glad they’re there. Simple to use, surprisingly versatile, and literally better at its job than my office scanner. Worked great for a while and still scans but will not email my docs. Now it’s useless to me. Thanks for ripping me off. This is an excellent app every professional should have! I use this every day. Easy to manipulate, professional output and rock solid software. This is the best scan app I have tried. It scans in black and white and color. It has improved from the last time I accessed it. The quality fax is a amazing. I have tried another app but I was not impressed. Find myself always using this. Don't get turned off if you take a picture of the document to be scanned and phone shadow is reflected on it. The end result will be flawless, if it is a black and white. Not sure what will happen if it is in color. I give it five stars because it is worth to have. You scan and email right from the app. How awesome is that. They also offer a fax app that has a cover sheet. You have to pay to fax. I have not used it but I have it on my phone if the need arise. Please try...highly recommended. Essential component in my wireless office. It’s invaluable, everyone in my orbit uses it. Not one issue. Worked great for a while and still scans but will not email my docs. Excellent scanning app but they should add OCR too. Best app I have. I use it almost every day. As an attorney, I often need to scan documents but don’t always have a scanner handy. This eliminates the need for one. The money spent on this app is by far the money I’ve spent for work. It works beautifully for what I need. If you love scan to email you’ll love this!! Was glad to find I could get to scanning without a lot of fooling around with setup, optional features, making any needless accounts, etc. Bottom line: it scans well and efficiently, and adjusts intuitively to different kinds of documents! I have used this app for a few years now with Android but recently switched to iPhone. Everything is great until I try to email the scanned file. It will not send. I can do everything else but send it. I tried sharing to photos but the recipients find the file too large to handle - same with copy and paste. Huge disappointment. Working at a dealership involves paperwork on the fly. This has given me a easy way to get that paperwork done in a pinch. I use it everyday and recommend anybody to have it for that just in case! Can't say much more. It works and is dependable. Great way to keep from losing paper and receipts. Have receipts for non profit org... Scan original recipes and email to finance office immediately From anywhere I can draft quick handwritten drafts of information, graphics or plans, and distribute a PDF to someone for immediate comment, review, or feedback. Would never want to be without it. Im so glad I don't still try to do this with just a straight camera photo. Probably my most helpful app! I remember the days of slowly scanning documents to the hard drive, so I love the app for its efficiency. Everything from work documents to signed releases for the kids sports tournaments to graded papers. The quality is exceptional. To the developers—keep on top of the updates. I would be sad if I ever got the “not compatible with most recent update, please contact developer”! I don't remember how much I paid for this app, but I know it's worth at least 50 times what I paid. Works flawlessly. Never had a single problem. Use it constantly. This is absolutely the most useful app I’ve ever bought. I’m an attorney, and I use it constantly. Not only does it scan with very clear images, it can link to Bluetooth printers and have the image printed instantly without having to go through a computer. Also has the option to upload to a cloud drive so you can make sure your files don’t get misplaced. Will be using for a long time. First time I feel an app deserves a review . This is the best app my phone currently has on it. This is a great app for convenience of docs and records needed and filed. Makes everything much easier. I have used several apps and this is the one I keep coming back to. Super easy to use and export into a number of files/actions. So appreciate that I can add pages and create a multiple page PDF! There may be newer scanners out there but this was the first or second app that I downloaded years ago and this has not let me down. Great pickup for me. I used it to send some docs just a moment ago. The quality is fantastic and the camera does as good of a job as my desktop scanner/fax/printer. I use this app constantly for business and personal use. I made it mandatory in my companies to have each team leader or supervisor download and use this software. It is the absolute easiest and BEST way to document transactions and to paper-trail important paperwork. It also helps to have documents that are consistently distributed to be saved in your app and then emailed as PDF’s from time to time. Very convenient and efficient. I not only recommend this app, I insist on its’ use. Better than other scanner apps! Have used for many years (at least 5) and have tried other apps. Simplicity and connectivity to send files in the mobile workflow is great! Truly an amazing app and very convenient to send documents via email as attachments. Used to work just fine but not lately. Doesn’t email to myself or any other contact. HELP! I’ve had this app for a couple years and it’s awesome, to the point I rarely use the scanner in my office any more. I’ve scanned everything from receipts to large format engineering drawings, and the result is every bit as good as any stationary scanner. The only two drawbacks are 1. The lack of a custom page size option (they finally added 11x17 which was a huge help) and 2. It’s confusing to save a file in Dropbox. It has a good iCloud Drive integration, I wish the same single button was an option for Dropbox. Very simple to use. Multiple options to save docs to device or email to self or recipients. Color or B & W.
Have been using this app for over 6 years, works wonderfully. I have never even looked for another scanner! I mean, why junk up my iPad. Does everything I need, simple, never crashes. I don’t know what else I could want a scanner to do. This program has been perfect for me to send repetitive reports, without a lot of extra overhead. I have found times where this old man got lost in the software of other products. Thanks for your fine program. Charles B.
I tried Neat and a few others but this is the best fit. Easy to use, reliable and adaptable. Great way to store important documents! I use it for receipts, photos, hand-written notes, etc. Use it frequently. Nice app. Would be 5 stars if you could add tabs to organize documents. Also would like the ability to copy/backup files to Google Drive, or to an external drive, etc. Currently you can only copy/backup files to iCloud only. Other than that the app does what it is suppose to do, Scan. Hasn't been very user friendly of late. Can't send images - freezes. I’ve used this app since the beginning AND continue to do so! I have not had any issues with using this product. Performs great and scans are very good. Would like to see a way to scan items quickly. May be there but not familiar. This app works perfectly every single time. I drive a truck for a living and have to scan and send docs every day and the pdf I send is always a mirror image of the document I scan. Perfect! Tried S/W on a multicolored page. Some background colors were darker than others and had a straight edge. The resulting scan only retrieved the areas containing text on a white surface and ignored the white text on a black surface. Also a horizontal series of color photos along the bottom edge were ignored. The scans were made in color mode. The attempts were made using a magazine that was on hand as a trial. Attempts to use multi-shots did not result in better readable results of the text. This was probably due to the movement of camera that souls occur if someone was hand holding the camera. Product is probably good for black on white . Just wonder about other situations. Fury the free version if it is available. Once you open an app it yours. Apple doesn't seem to believe in trial periods. One of the best scanning apps! It’s one of my favorite apps on my phone it is what I want and I love it. I use this app all the time to scan, email and upload to Google Drive and love it. I know I have some duplicate files between my phone and Drive but I know my scans are definitely on my phone (backed up with docs&data) unless I deliberately moved them off. Have been using this app for years. Simply the best out there. Simple and easy. I’m always needing to scan everything from receipts to important documents on the go and found it a pain to wait until I was back at the office to scan them in. With this app it’s easy on the go and the attachment options are easier, faster, and better than any scanner software I’ve ever used. Great app, but not necessarily business grade. Easy to use and allows you to adjust the frame and many other features. A truly must have for anyone. For quick scans from your phone this product gets it done. I need simple and this is it. I’m always on the go and sometimes can’t get to my office, I pull out my mobile phone snap a pic and send a scan in less than 3 minutes for the total process. I love it and can’t live without it. I use it to send everything to everyone. I’m always telling people to get it. I have tried/used a number of these types of scanner apps and while this is not perfect, it is the best I have experienced. Pretty easy to use but it could use a little better instruction on functionality. A lot of my using this has been through the "baptism by fire" method. Overall I would absolutely recommend. I use this quite often for work and send material to my boss via this app. That in and of itself speaks to my belief in this product. I mainly archive my installation contracts for quick review, import multiple drawings for single pdf viewing, and use the app as for quick document sharing. I would love to be able to make folders to organize everything for a cleaner space and to separate jobs and types of documents. Nice to be able to scan by phone to keep track of receipts on the go. No more lost receipts. I use this app to Scan checks and receipts. I used to be able to easily move those items into dropbox but now I can’t. I don’t know what has happened with this app but it wants to send a message or share to other people in dropbox. I can no longer move anything into my dropbox accounts which is why I am only giving it 2 stars because it’s almost useless and seriously, I probably should only give it one star at this point. I am hoping that something will eventually change and I will be again able to move my scans into Dropbox. It works so well. Easy to use. It has made my job easier. This is a wonderful app! Saves me so much time! It’s quick and easy to use! Have used it for several years now, I love it! must have app. use it almost everyday and am always impressed with it. I use this application all the time and love it. Best App!! User friendly, easy to use. I tell everyone about it! The best app for me. I love this app. I use it for my business and personal needs. I use it just about every day. It’s extremely functional and user friendly! Love this app! Probably the most useful and productive app on my phone. I Use it for all of my receipts while on the go and at home doing expense reports and taxes. The days of scanner/printers are numbered. This app makes a bulky flatbed scanner obsolete if only using for documents. Extra bonus: Also a fun tool to get creative with photography! I haven't tried any other scan apps because I haven't needed to. This one is excellent. I work on the road for a small charter airline and need to get documents to HQ taking pictures in less than ideal lighting conditions. Turbo Scan does a marvelous job w B&W or color. Easy interface. Never had crashing probs. Sometimes tells me I'm low on memory, but I ignore and have never had a problem. Highly recommend. Dec 2015 update. Still awesome. They just updated so the 3X taking scan (photo) is just one click now. Good job folks. Dec 2017 update. Sorry for the broken record, but still loving and using this app a lot. April 2018 update. Not just because I want these programmers to succeed, but also because I use the app all the time. It’s great. You won’t be disappointed. Turbo scan is an outstanding product it is help me with all kinds of things like as built drawings etc.… It is a handy tool to use for any project. I’m in the car business and find it very helpful to format pictures sent to me and print them off. I also love the ability to email over documents to my customers all from my phone. I have to email my time in to my shop this app is awesome for that I take a scan with my phone and the girls in the office can read my time card clearly in fax format. This is a powerful app. It allows for multiple pages, direct email of the document, even sending copies to myself. I always have my phone, since I don't carry a scanner around! It's well worth the minor price. Can’t think of how this product could be better. I’ve had this app for years now and it has been a great resource for me! Won’t save documents on iOS 11.3. Contacted company about it months ago and still no update? I’ve deleted and reinstalled, closed all apps, reset phone. Nothing works. Used to be a great app. So quick and easy to use it! Great App but got slower. My "go-to" app for photos! My "go-to" app for photos! Clarity of the three merged photos is wonderful. I have used this app for several years to copy handwritten applications, leases and other very old docs... great results! This app is great and super convenient. It’s has saved while I’m on the road and not in the office. Very easy to use and the documents are high quality. This app works. That is the greatest compliment I can give it. It works. This us excellent app I love ! I am in trucking business, often don’t have fac or scanner available- I was able to quickly scan and submit my paperwork thanks to this app. Life saver indeed! I have been using TurboScan for the past couple of years now. I am a business owner that works a lot from home and this is the most convenient amazing app I’ve ever used. My son gifted TruboScan to me so I could scan my medical receipts and save to a file. I am able to keep the scanned docs in s file for easy tax time access. I can not tell you how many times this app has been a quick solution for things I don’t readily think of. I’m keeping it! Only wish it had an option to fax directly from the phone as well. Not too many places require faxing anymore except for the government! Unfortunately, I need to fax every once in awhile and it’s a pain. I love this App. I’ve used it across many Iphone and it has helped me acquire many houses cars, scanning loan docs. This is by far the best app for scanning! Not only is it easy to use, but you can email the documents directly from the app. Furthermore, the app saves the documents or you can save to your cloud, which allows for easy access to all scanned documents! Among all other great features, I love the fact that every scanned file has a symbol next to it to let me know that if I’ve sent it already. Love this app! I don't have to buy a scanner. Works great every time. Thanks! This is an amazing little app. It is my photo copy machine for anything that's going to be transmitted electronically. It's simple to use and creates a perfect PDF or image file from anything. I love the ability it has to frame a document so any background disappears. It's much better than just using the camera. It really has become my "go to" app.